ADAR, N. , KUVAT, G.
A parallel genetic algorithm (PGA) conducts a distributed meta-heuristic search by employing genetic algorithms on more than one subpopulation simultaneously. PGAs migrate a number of individuals between subpopulations over generations. The layout that facilitates the interactions of the subpopulations is called the topology. Static migration topologies have been widely incorporated into PGAs. In this article, a PGA with a dynamic migration topology (D-PGA) is proposed. D-PGA generates a new migration topology in every epoch based on the average fitness values of the subpopulations. The D-PGA has been tested against ring and fully connected migration topologies in a Beowulf Cluster. The D-PGA has outperformed the ring migration topology with comparable communication cost and has provided competitive or better results than a fully connected migration topology with significantly lower communication cost. PGA convergence behaviors have been analyzed in terms of the diversities within and between subpopulations. Conventional diversity can be considered as the diversity within a subpopulation. A new concept of permeability has been introduced to measure the diversity between subpopulations. It is shown that the success of the proposed D-PGA can be attributed to maintaining a high level of permeability while preserving diversity within subpopulations. E. Alba and J. M. Troya, "Improving flexibility and efficiency by adding parallelism to genetic algorithms," Statistics and Computing, vol. 12, no. 2, pp. 91-114, 2002. N. Xiao and M. P. Armstrong, "A specialized island model and its application in multiobjective optimization," in Proc. of Genetic and Evolutionary Computation Conference, pp. 1530-1540, 2003. G. A. Sena, D. Megherbi, and G. Isern, "Implementation of a parallel genetic algorithm on a cluster of workstations: traveling salesman problem, a case study," Future Generation Computer Systems, vol. 17, no. 4, pp. 477-488, 2001. L. Wang, A. Maciejewski, H. Siegel, V. Roychowdhury, and B. Eldridge, "A study of five parallel approaches to a genetic algorithm for the traveling salesman problem," Intelligent Automation & Soft Computing, vol. 11, no. 4, pp. 217-234, 2005. Y. Fan, T. Jiang, and D. J. Evans, "Volumetric segmentation of brain images using parallel genetic algorithms," IEEE Transactions on Medical Imaging, vol. 21, no. 8, pp. 904-909, 2002. T. Jiang and Y. Fan, "Parallel genetic algorithm for 3D medical image analysis," in Proc. of IEEE International Conference on Systems, Man and Cybernetics, vol. 6, 2003. J. I. Hidalgo, M. Prieto, J. Lanchares, F. Tirado, B. De Andres, S. Esteban, and D. Rivera, "A method for model parameter identification using parallel genetic algorithms," Recent Advances in Parallel Virtual Machine and Message Passing Interface, vol. 1697, pp. 291-298, 1999. T. Hiroyasu, M. Miki, and M. Negami, "Distributed genetic algorithms with randomized migration rate," Systems, Man and Cybernetics, vol. 1, pp. 689-694, 1999. M. Rebaudengo and M. S. Reorda, "An experimental analysis of the effects of migration in parallel genetic algorithms," in Proc. of Euromicro Workshop on Parallel and Distributed Processing, pp. 232-238, 1993. E. Alba and J. M. Troya, "A survey of parallel distributed genetic algorithms," Complexity, vol. 4, no. 4, pp. 31-52, 1999. E. Cantú-Paz, "Migration policies, selection pressure, and parallel evolutionary algorithms," Journal of heuristics, vol. 7, no. 4, pp. 311-334, 2001. E. Cantú-Paz, "Topologies, migration rates, and multi-population parallel genetic algorithms," in Proc. of the Genetic and Evolutionary Computation Conference, San Francisco, pp. 91-98, 1999. E. Cantú-Paz, "Markov chain models of parallel genetic algorithms," IEEE Transactions on Evolutionary Computation, vol. 4, no. 3, pp. 216-226, 2000. E. Cantu-Paz, "On the effects of migration on the fitness distribution of parallel evolutionary algorithms," Lawrence Livermore National Lab., CA (US), UCRL-JC-138729, 2000. J. Berntsson and M. Tang, "A convergence model for asynchronous parallel genetic algorithms," in Proc. 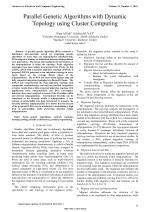 of The 2003 Congress on Evolutionary Computation, vol. 4, pp. 2627-2634, 2003. Y. Maeda, M. Ishita, and Q. Li, "Fuzzy adaptive search method for parallel genetic algorithm with island combination process," International Journal of Approximate Reasoning, vol. 41, no. 1, pp. 59-73, 2006. E. Alba, F. Luna, A. J. Nebro, and J. M. Troya, "Parallel heterogeneous genetic algorithms for continuous optimization," Parallel Computing, vol. 30, no. 5, pp. 699-719, 2004. E. Alba and J. M. Troya, "Analyzing synchronous and asynchronous parallel distributed genetic algorithms," Future Generation Computer Systems, vol. 17, no. 4, pp. 451-465, 2001. S.-K. Oh, C. T. Kim, and J.-J. Lee, "Balancing the selection pressures and migration schemes in parallel genetic algorithms for planning multiple paths," in Proc. of IEEE International Conference on Robotics and Automation, vol. 4, pp. 3314-3319, 2001. T. Friedrich, P. S. Oliveto, D. Sudholt, and C. Witt, "Analysis of diversity-preserving mechanisms for global exploration," Evolutionary Computation, vol. 17, no. 4, pp. 455-476, 2009. D. E. Goldberg, The design of innovation: Lessons from and for competent genetic algorithms. Springer Science & Business Media, Dallas, TX, U.S.A., pp. 132-141, 2013. J. Gu, X. Gu, and M. Gu, "A novel parallel quantum genetic algorithm for stochastic job shop scheduling," Journal of Mathematical Analysis and Applications, vol. 355, no. 1, pp. 63-81, 2009. J. Denzinger and J. Kidney, "Improving migration by diversity," in Proc. of The Congress on Evolutionary Computation, vol. 1, pp. 700-707, 2003. L. Singh and S. Kumar, "Migration based parallel differential evolution learning in Asymmetric Subsethood Product Fuzzy Neural Inference System: A simulation study," in proc. of IEEE Congress on Evolutionary Computation, pp. 1608-1613, 2007. M. Lozano, F. Herrera, and J. R. Cano, "Replacement strategies to preserve useful diversity in steady-state genetic algorithms," Information Sciences, vol. 178, no. 23, pp. 4421-4433, 2008. Q. Li and Y. Maeda, "Distributed adaptive search method for genetic algorithm controlled by fuzzy reasoning," in Proc. of IEEE International Conference on Fuzzy Systems, pp. 2022-2027, 2008. R. W. Morrison and K. A. De Jong, "Measurement of population diversity," Artificial Evolution, pp. 31-41, 2001. 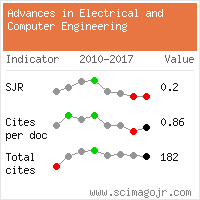 Citations for references updated on 2019-04-22 06:53 in 129 seconds.